There was a small ripple on Twitter last year about an emerging genre featuring post-high school characters that were often in college or just out. It was kind of upper-YA, but went a bit further. The phrase “New Adult” began appearing in my feed. Just as quickly, agents, editors and other publishing professionals responded with tweets putting down the idea, calling it a fad that was going nowhere. It was unsellable, not a “thing” and to ignore it. So I went back into my writing cave and did just that. WANT was released as Upper-YA. SHRAPNEL was released as Upper-YA. It’s a year later, and New Adult is now a recognized, legitimate category championed by indie and self-published authors, some of whom are making six figures in a month and hitting best sellers lists. They’re being chased by agents and editors. You know, if WANT were released right now, you’d be on the best seller list. You were ahead of your time. I knew when I finished writing WANT that, even though the MC was 17, it stretched the boundaries of Young Adult. The issues and situations are adult and most of the other characters are adults. Sure, the plot hinges on Juli technically being a minor, but the material isn’t suitable for younger teens. I know these things lost me agents, but that’s how the story had to be written. Though I’m pulling my hair out that I was ahead of the curve, I’m thrilled that stories like mine now have a solid place in the market and readership. It’s a great time in life to write about—spanning the years when we leave the safety of traditional school and home to become adults. And while I can’t change the past, I can change the present and future. With Inkspell Publishing’s blessing, I’m declaring WANT a New Adult title. To celebrate, I’m giving away a paperback copy on Goodreads. The deadline to enter is March 15, the same day the cover for NEED, WANT’s adult follow-up, is revealed. So please enter to win, add it to your TBR list, tweet it, share it, etc. and because I’m giving away one of my own paperback copies, I’ll be happy to personalize the inscription if you’d like. Now, because I’ll admit I mostly missed out on the emergence of this category, I’d love to hear your thoughts. Have you read any NA titles? What do you think are the difference between Upper-YA and NA? Is this just a fad or is it here to stay? Who are the leading authors of NA? This is the same thing I heard two years ago at a writer’s conf, Stephanie. And all my heroines tend to fall in this 17-20 yr category dealing with things just out of reach of High School. Yay for us and the genre! Looking forward to what lies ahead. I am a firm believer in the order of things. To everything there is a season and a time to every purpose under heaven. Congratulations on your three stories! That’s an amazing accomplishment. Thanks so much! I’ll be sure to follow the #NALitChats, too. As a librarian, I feel much more comfortable with this label. Even as an Upper-YA novel, I haven’t felt comfortable recommending WANT to most teens, but I don’t have a problem at all pitching it to college students. Our library actually cataloged WANT as an Adult novel, so New Adult is a very fitting genre descriptive. No shame in being ahead of the game. Someone has to be first in order for a trend to emerge. It doesn’t surprise me at all that it’s you. Can’t wait to read NEED! I have the same problem in one of the novels I’m working on right now. The MC is 19, so she’s too old to be YA and too young to be adult. At the SF Writer’s Conference, however, several agents told me it’s YA. I think Upper-YA or New Adult fit this novel. I think the only thing you can do is write the story the way it needs to be written and worry about genre or category later. It may lead to head-bashing (like I mentioned above!) but you’ll be true to your creativity. Best of luck! Steph, gutsy move, but sounds like the right move. Good for you! You go! Way to go Steph! I loved WANT and am looking forward to NEED. Ah! 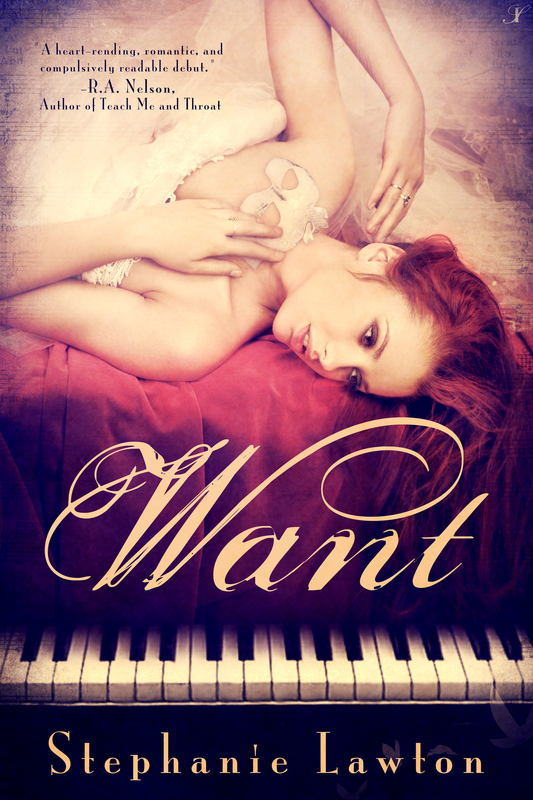 I want a paperback copy of WANT! Hopefully I win!